Hindwa Surya Maharana Pratap Award to a Senior Citizen-Male-Urban Area. Best Senior Citizen- Female- Urban Area. Marathwada Kesari Shri Annsaheb Gavane Award to a Senior Citizen-Male-Rural. Shrimati Suman Annasaheb Gavane Award to Senior Citizen-Female-Rural. Best Senior Citizen Association Award-Urban Area. Tatya Saheb Bhole Best Senior Citizen Association Award- Rural Area. Best Senior Citizen Woman Association Award. Kalinga Award for enrolling maximum number of subscribers of AISCCON NEWS. AISCCON Award for Best House Journal /Bulletin/ Newspaper published. Rajarshi Chhatrapati Shahu Award for State Level Federation forming maximum member of senior citizen associations and organizing maximum member of programmers for senior citizens in rural area during the financial year 2018-2019. Dr. Suganchand Bhatia Award for writing a book in Hindi or English on issues of Senior Citizens. Kamala Sahu Social Services Award for woman social worker for doing service to ailing and destitute women senior citizen. We enclose Form A (for individuals) S.No. 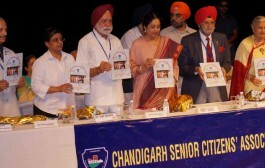 1,2,3,4 and Form B (for Senior Citizen Associations) Sr. Nos. 5, 6 and 7 for consideration of the above Awards. Form ‘C’ is for S.No.9, AISCCON Award for Best House Journal. Form D is for S.No.10, for state level Federations only. Form E is for S.No.11, Dr. Sugan Chand Bhatian Award Form F is for S.N.12 Kamala Sahu Social Service Award. Those entries, which are only in prescribed from will be entertained. As regards No.8, Kalinga Award, there is no entry form. This Award will be give on the basis of data available with Managing Editor, AISCCON NEWS. These forms duly filled in should reach our office on or before 31.08.2019, through respective State level Federation. However advance copy may be sent to us directly. Entries should be in the prescribed forms.